In 1976 Carole Catto discovered a collection of exciting primary coloured wallpapers from Duro in Sweden. At that time, other than expensive US imports, there were very few bright wallpaper designs available on the UK market. In reality there was little available outside of the traditional muted European collections and thus, these affordable, painterly, surface printed designs in checks, stripes and clouds were very appealing, particularly for the rather neglected children’s market. Later that year Carole joined forces with Mike Hall, the then Sales Director of Today Interiors, and the Paper Moon partnership was formed which has now continued for over 40 years. Paper Moon’s distribution launched from a retail showroom in London’s Hampstead Village. The first and many subsequent Duro collections were very well received and the Paper Moon brand soon became synonymous with fun, novelty wallpaper and fabric designs in bright palettes. In line with the originality of their collections Paper Moon were celebrated for bringing a new themed style of exhibition stand to the annual Decorex exhibition. A Vintage Beach scene complete with saucy postcards, a carriage on the Orient Express and a fairground Carousel were amongst stands that won awards. 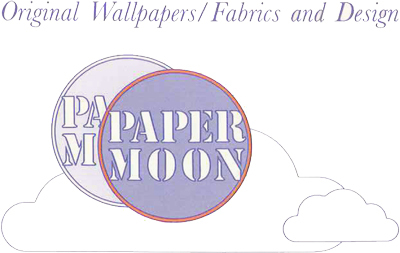 Following a rapid expansion, Paper Moon subsequently took over the Drama Decor company thus gaining access to several innovative American manufacturers of wallcoverings, fabrics, textile wallpapers and grass cloths and the combined companies traded from a large warehouse facility in Neasden, West London. Today we import and distribute designer wallpapers, fabrics and murals sourced from around the world. We cover every style from Country to Colonial through Contemporary and Classic, plus continuing a wonderful selection of Children’s designs. Due to the extensive number of collections that we currently distribute, it would be impossible to show all the designs on this website and therefore we have chosen a selection of our most original, popular and best-selling designs. If you are unable to find what you are looking for, please e-mail us a description and we will make every attempt to fulfil your requirements. Through our new website we would particularly like to offer young and upcoming designers the opportunity of showcasing their designs and create a platform that will allow them to promote these designs to our existing and future customers.